Authentic detached manor with private garden, in the little village Souto de Alva. This is one of the few original manors of nobility in Portugal. The manor was the former property of a judge. It is built in granite and decorated stately with antiques. The original baroque furniture is of good quality. The manor offers a large garden (ca. 1200m2) with a lawn, barbecue and many fruit trees. Here you can enjoy the Portuguese climate and the quietness of a village with less than 300 inhabitants. At ca. 5km you can find the termal cities of Carvalhal and S. Pedro do Sul (explored by the romans since the 1st century). Furthermore at 50km is situated Portugals highest mountain Serra da Estrela and also the nature and surroundings offer a wide range of leisure activities. The small villages like Souto de Alva are undiscovered and worth a visit, as well as the city Viseu (ca. 25km). 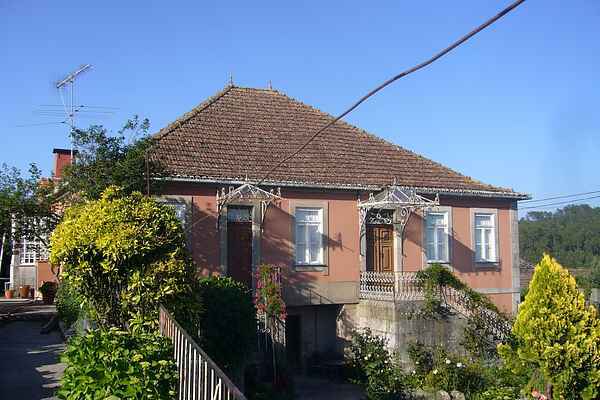 This holiday house offers you a unique possibility to spend your holiday in a authentic Portuguese manor! Other activities and things to visit in the surroundings; - Nature reserves where you can enjoy all kind of activities from radical sports to walks in the the nature. - City of the Lusitania hero Viriato, who fought the romans. - From the historical interests, the cathedral and the romantic parks to other interests: a place where you can enjoy a bike ride in the old train rail now transformed in a ecological path, golf, museums and nature and a busy night life. -Serra de Arouca, Serra do Montemuro, Serra da Estrela, three beautiful mountain areas with a lot to discover. - In this region you'll have the Portuguese village life experience with the possibility also of eating the authentic food from the region in your house vacation or in the cook's house.